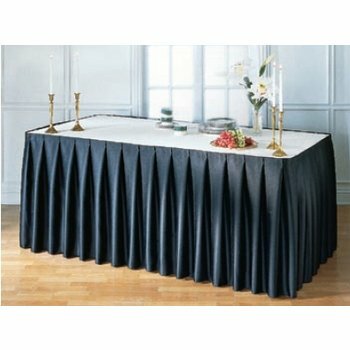 Shown: 5024 TruFinish™ Classic Twill Weave Table Skirt (with Hook & Loop header, accordian pleat, and 5118MP Spring-OnTM Clips) in Black(014) with Table Topper in White(010). Use to cover the top of skirted tables for a more defined, finished look. For best results, allow an 8" (20cm) drop on all four sides of the table to accommodate the attachment system. For buffet set-ups, use Vinyl Table Toppers for easy clean up of spills. Toppers are available in the same color and fabric used for the skirt or select a contrsting color for versatility. Choose from our vast selection of fabrics, vinyls, prints, and colors featured in the catalog.